South with a Birds Eye view of the fire. For more information visit the city of Pasadena website at http://www.cityofpasadena.net or the Air Quality Management District website at http://www.aqmd.gov, or call Pasadena Public Health Department (626) 744-6012 or AQMD at (800) 288-7664. Winds are expected at 15-20 mph today and containment isn’t expected until Tuesday or Wednesday per KPCC. Currently 350 acres burned and 400 firefighters are on the scene. Here are updates from area listserves. up. Of course that could change. > intermittent wind shift this way. > alert other Fire Safe Council members as necessary. > That’s all the news I know at this time. Have I Talked About My Garden? I should have been writing about this all along, but haven’t for some odd reason. In February my husband and I dug up our rosebushes and replaced them with lettuce, beets, arugula, tomatoes, herbs and sweet peas. We had bought a lot of other seeds, but didn’t have enough room. I was worried about foraging rascals of the wild coming to dine on our feast, but none appeared. We’ve eaten all but one head of lettuce, planted way too much arugula and are waiting for the tomatoes and beets to mature. It’s been a joy to have a vegetable garden again. Barbara Kingsolver’s Animal, Vegetable, Miracle was a bit of a spur to get us going, plus the roses were looking rather pathetic the past couple of years. It is our small effort at being more self reliant and eating healthier. We’re considering reclaiming a stretch of our lawn for cultivation, as well. We have too much lawn sucking up too much precious water. That effort will probably have to wait until next year. We’re opening up Steve’s new office here in Altadena and trying to complete some home improvements that are desperately needed. In the meantime I’ll support the new Altadena Farmers Market in addition to the one in La Canada and go visit the community garden on Lincoln to see what they’re up to over there. Garden on!! I started to write this morning that our little nest has been vacated by mom because haven’t seen her in the nest since Sunday. I have seen her flying about a couple of times, but no nest visit. As I was writing I decided to check again and there she was, though she flew away as I neared. At least she’s there and hope continues for the offspring. From the LBNelert — would like to see more sources on this. But some common sense advice we can all follow and improve the situation: avoid using chemicals in your yard. No pesticides, no weed killers, no poisons. Use natural alternatives and work with nature instead of trying to fight it. In case you haven’t noticed, we’re not winning. WHY FLOWERS HAVE LOST THEIR SCENT: Pollution is dulling the scent of flowers and impeding some of the most basic processes of nature, disrupting insect life and imperiling food supplies, a new study suggests. The potentially hugely significant research – funded by the blue-chip US National Science Foundation – has found that gases mainly formed from the emissions of car exhausts prevent flowers from attracting bees and other insects in order to pollinate them. And the scientists who have conducted the study fear that insects’ ability to repel enemies and attract mates may also be impeded. I’ve been loving all the exotic sounds filling the hills of late. Birdlife is everywhere, including my yard. The other day two hummingbirds were flying around while we ate dinner outside, and now it’s obvious why. 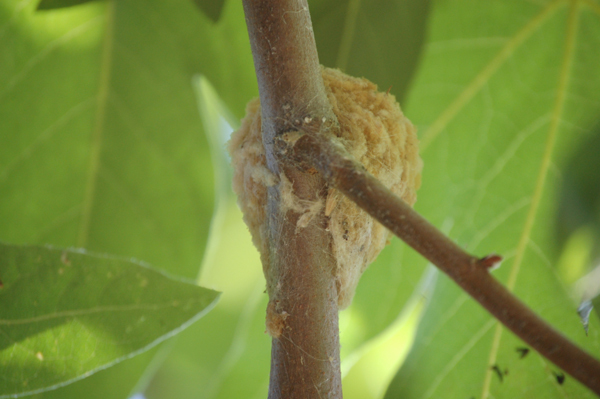 This morning my husband discovered a hummingbird nest low in our backyard sycamore tree. Beautiful little thing. We ran out and bought a new feeder to make sure the mother-to-be doesn’t have to go far for her energy. Now I need to study up so I know what to expect for the expecting!